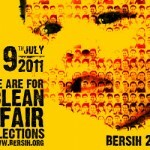 blog re-vamping… and bersih 3.0 – welcome! EXCUSE THE BLOG – IN PROCESS OF REVAMPING! 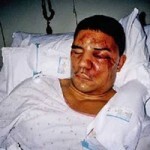 my blog had been inaccessible for the past weeks. anyway before it had been inaccessible i had been slowing down in blogging too. then when i can't access my blog at all, so all together stop blogging of course. this is because of server migration of my blog. now that it is ok, i can start blogging…. BUT i realised there is still some problems with my blog. i guess i will have to revamp my whole blog. i try to change theme just now, and realised some themes still contained virus! i thought after migrating, the virus can disappear or the problem (like seeing rubbish right on top) can disappear. since it can't, i have no choice but to revamp my whole blog… maybe even entirely start a new one, with a new name. after all, not blogging regularly and stop blogging, nobody knows about my blog existence anymore, so it's good to change everything. however to do that, i need a lot of time (and discipline!). so i guess this means although now my blog is back again, i'll still not be blogging until i revamp the blog. 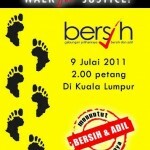 however, before i stop blogging (to revamp my blog), i need to post (announce) about bersih 3.0.
last year, bersih 2.0, i was at KL and had blog about it. my story had been published in 3 online media (malaysiakini, malaysian insider, malaysia chronicle…. and lim kit siang' took the story from malaysiakini to post on his blog). 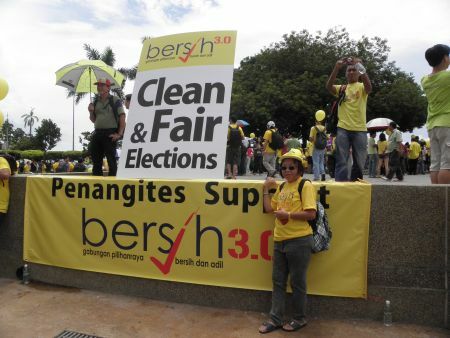 this year, since penang hold bersih 3.0 too, i did not go to KL….. although i had so much wanted to go to KL. i know it will be more exciting in KL so i really prefer KL…. but my friends did not want to go to KL, so nobody to get lift from or take bus together. suaram penang did organised a bus trip though but i had problem getting to the pick-up and drop-off point. well, after thinking hard, i decided to stay right in penang, attend the penang bersih instead of going to KL bersih. what a pity! i missed the excitement in KL… missed the tear gas and water canon. lol. oohh… also now i don't have an exciting story to write to online media. 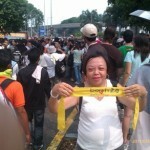 yes i was at penang bersih, which was organised by aliran. penang's gathering was very peaceful indeed and had the highest turn-out among the other cities (excluding KL of course). about 7000 people were present! 7000! some though put it as near 1000! the esplanade field was almost filled up. i'm very glad i was there…. to be part of history, it being the biggest gathering in penang, organised by an NGO (since march 8). oh, i was there as citizen journalist (CJ) and i had taken lots of photos. you can see my photos at my facebook album. i had also send some better photos to CJMY to be published as photo blog. then as i had interviewed a few people during the gathering, i also wrote about the interview for CJMY. my fellow penang CJ colleagues had also video taped the gathering. i'm going to post all the links here, and please do take time to read them, ok? for bersih 3.0 report in other cities, including KL, do drop by the CJMY website, ok. there are lots of reports with lots of good, interesting photos and videos. of course if you google for bersih 3.0, you will find lots of other videos on youtube… and oh lots of reports here and there on various news portal. so i need not say anything about it. i just hope you guys will drop in to our CJMY website and also to our CJMY facebook. do support us, ordinary people like you, who love writing, recording video, reporting!